I’ve made countless batches of macarons over the last month, experimenting with all sorts of flavours. These, the Mogador macaron by Pierre Hermé, are one of my favourite flavours. The egg shell thick shell gives way to a pillowy almond meringue and a decadent, floral passion fruit-milk chocolate ganache. The acidity of the passion fruit balanced the sweetness of the milk chocolate nicely. They were totally worth risking my life for. Powdered food colouring is a pain to find in Toronto but is the best option for making macarons. Sure, you can order it online and pay hefty shipping and handling costs but I was determined not to. I spent about a week looking for the best place to buy powdered food colouring, and I ended up finding a store that was located in a pretty dangerous area. All the other places I found were baking supply shops, but charged double the price of this little South Asian grocery store. The store is located on an industrial road in a not so nice part of town. I looked it up on Google maps. There were two inch thick metal bars in all the windows and in the door, and the street was empty in the middle of the day. There were also a few shootings there last month. I tricked my brother into driving me there and told him that he shouldn’t bring anything of value with him. The store itself wasn’t that scary. I went in and bought powdered food colouring, and then I left. Special thanks to Mardi from Eat. Live. Travel. Write. for helping me with some technique issues. 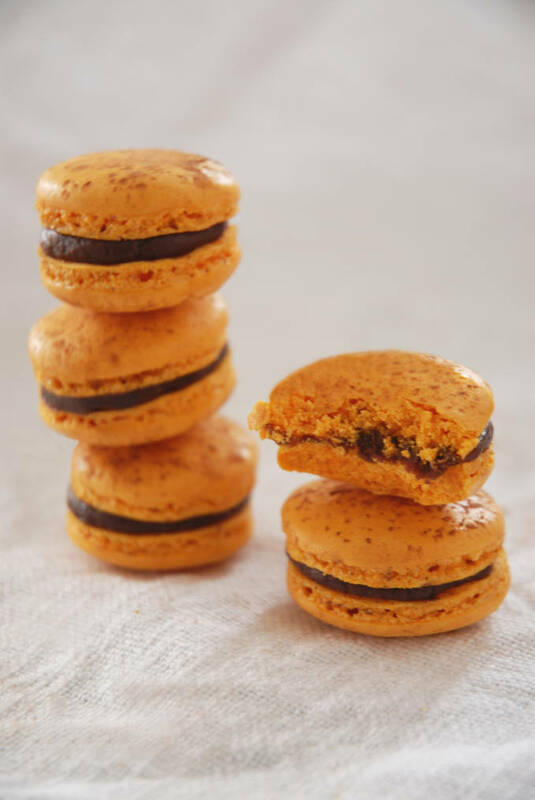 Mogador macarons, by Pierre Hermé, are filled with a velvety smooth and decadent milk chocolate passion fruit ganache. Follow the directions I provided in my macaron tutorial for best results. Ten minutes before baking, dust the shells with cocoa powder. Partially melt the chocolate over a double boiler and boil the passion fruit juice. Add the passion fruit juice into the chocolate in three additions, stirring slowly to incorporate. Once chocolate reaches 60°C (140°F) add the butter in a few cubes at a time and stir until glossy and combined. Pour into a container, cover the top with plastic wrap, and cool for about an hour and a half. Pipe onto half of the macaron shells, sandwich the cookies, and let rest in the refrigerator for a day and a half. Let come to room temperature before eating. They look fantastic! Now you need to go back to the Asian store and see what other delights they have for you. Hey Ilan, Golda’s Kitchen charges very reasonable shipping and it’s only in Mississauga… #nexttime. These look great! Also, if you can find passionfruit jam that works well for the ganache too! Great macarons, I love the colour! I’ve never had passionfruit, am I missing out? I have never had much luck with macarons…so maybe I should just pay you to ship me a dozen or two. These look delicious and the flavor pairing sounds so elegant. Thank you for sharing! I’m glad to be back home after a week of traveling…and finally catching up on my favorite blogs. I hope you have a blessed week! The ganache sounds SO good, you did such a good job on these! So pretty! I need to try macarons again when I get time. They’re too friggin good. This is really beautiful and you are absolutely right, worth risking your life for sure! Passion fruit milk chocolate ganache? 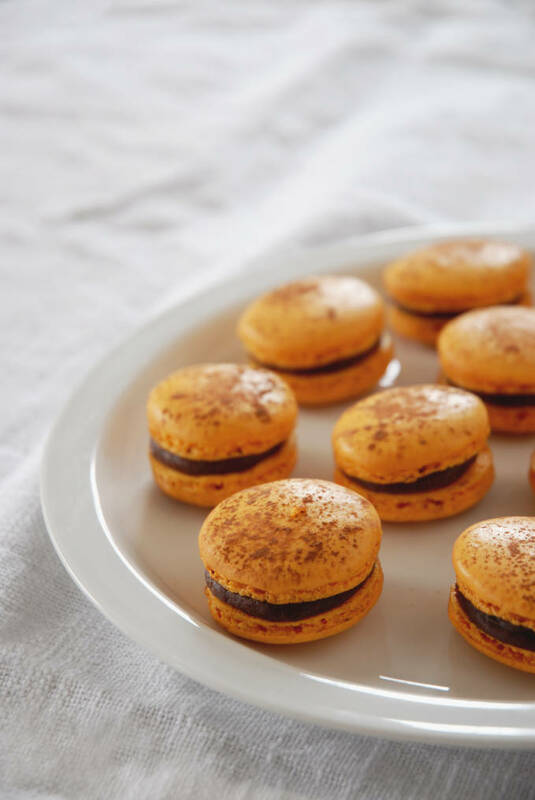 Just that alone makes these macarons sound very intriguing and very delicious! They look so nice, too. Thanks, I love it as well! Hey, found you from the Listserve! Love your blog – great photos and recipes. Keep on keepin on and much love for Toronto! 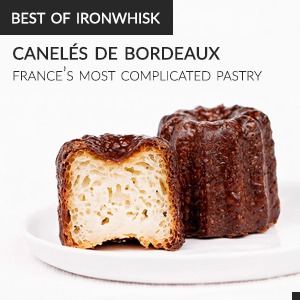 The ganache is not supposed to taste sour, but just have a little acidity to it. I would add a touch of sugar to the passion fruit juice before stirring it into the chocolate. I can try to help you troubleshoot your macarons if you’d like. What’s the problem? where do you find that time to make all these goodies!!!! What’s the name and address of the store where you found the powdered food colouring? Hi Carrie – I can’t remember the exact address, sorry. It might not help you though since I’m in Toronto. If you’re from Toronto too, I can try figuring it out for you. Let me know! I’m in Toronto as well, but no biggie if you can’t remember. I found another comment from you saying the area and I’m guessing it was a little hole in the wall with an unmemorable name. if you figure it out though, let me know. Found it! 308 Eddystone Ave, North York, Toronto, ON, Canada. Try it out if you don’t want to go to Golda’s. Good luck! Lovely! I am trying these out later this week. Did you just use the passion fruit juice or did you include the pulp as well. Thanks!